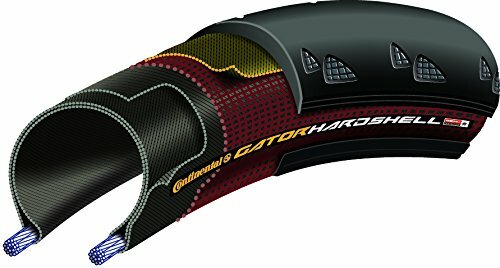 Continental 0100312 Gator Hardshell 700 x 25 Urban Tire with Duraskin has set the bar for a perfectly-balanced blend of ride quality and long-term durability without breaking the bank…but still the roads of North America demand a model even tougher. The all new Gator Hardshell delivers! Sharing the bead-to-bead protection of Duraskin, the Hardshell casing wraps further into the sidewall and an extra-wide Poly-X breaker covers the entire tread strip from shoulder-to-shoulder. Added material in the tread strip not only improves mileage, but lends yet another degree of puncture resistance. More isn't always better, but in this case - more is exactly what you get. Specs: Weight - 330 grams; Recommended PSI - 95; Maximum PSI - 120; PU - 10. PERFECTLY BALANCED- The Gatorskin has set the bar for a perfectly balanced blend of ride quality and long term durability, all without breaking the bank. POLYXBREAKER- The polyester fibers overlap during manufacturing, yielding a very dense fabric and minimal space in-between threads, making the PolyX highly resistant to any foreign body without reducing the rolling resistance. DURASKIN- Sidewall protection coming from the high quality polyamide fabric encasing the core casing of the tire from scuffs and cuts under the worst conditions. HARDSHELL- Hardshell protection is comprised of three main components, a deep casing overlap providing added sidewall protection, and extra wide PolyX breaker protecting the entire tread strip and finally, the casing is sheltered by a bead to bead layer of DuraSkin fabric.